Christchurch MP Christopher Chope has urged the government to speed up the creation of a combined authority for Dorset. The proposals - which are separate to plans to cut the number of councils in the county - were submitted to the government in July last year. Under the plans, Dorset's nine councils and the Local Enterprise Partnership, would work together on key issues. The government previously said a decision would be made in early 2017. Speaking in the Commons on Monday, Mr Chope urged Sajid Javid, Secretary of State for Communities and Local Government, to bring forward an order that would allow the combined authority to be set up on 1 April. Mr Javid told Mr Chope the government had "only just received the proposals" and wanted to "take the right amount of time to consider it carefully". Image caption Mr Chope called plans for two unitary authorities a "dilution of democracy"
The plan would see Dorset Local Enterprise Partnership and the county council work with the borough and district councils as equal partners on issues of strategic economic development, regeneration and strategic transport. Mr Chope said he had previously raised concerns that residents did not understand the difference between the combined authority plan, which would see all the councils retain their identities and boundaries, and a separate plan to cut the number of authorities from nine to two, which has been the subject of a recent public consultation. During the consultation, residents were told cutting the number of councils would protect frontline services, reduce costs and stimulate jobs. But the Conservative MP, who called the two-council plan a "dilution of democracy", said those benefits could also be achieved with the creation of a combined authority. 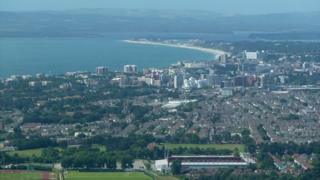 Poole chief executive Andrew Flockhart, who is lead officer for the Dorset Combined Authority, said Dorset's councils remained committed to the combined authority proposal and officials were working with the government to iron out some "technical issues". He said the creation of the combined authority was aimed at tackling transport and economic issues and was a "very different proposition" to cutting the number of councils.